Site of the new soccer field in Clarkston, Georgia. 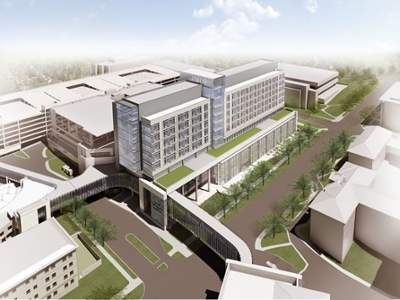 As the Emory University Hospital expansion rises on Clifton Road, the construction team behind it has found that digging space for a nine-level, 450,000-square-foot building with 500 underground parking spaces kicks up a lot of dirt. To continue the sustainability efforts that have already been planned in making of the new bed tower, the team set a goal to find another organization that could use the dirt that was displaced during the site expansion. As luck would have it, they found a most deserving recipient. Multiple dump trucks hauled 78,000 cubic yards of dirt and filling material from the work site to nearby Clarkston. The dirt will be used to construct a soccer field at the Fugees Academy, the nation's only school dedicated to refugee education. Fugees Family, Inc., is a non-profit organization devoted to working with child survivors of war. The organization's efforts include year-round soccer for 90 boys and girls ages 10-18, after-school tutoring, soccer for 50 elementary-aged students, an academic enrichment summer camp and the Fugees Academy. A.L. 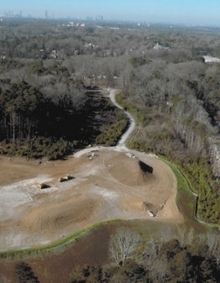 Grading Contractors, Inc., imported and placed the dirt at the site, while Breedlove Land Planning provided engineering services, which together would have cost more than $1 million. In the spirit of assisting Fugees Family in its philanthropic endeavor of providing recreational and learning opportunities for the refugee children residing in the Clarkston area, A.L. Grading’s lump sum fee was just $1.00. to the Emory Clinic Building B. The hospital expansion is expected to open in 2017.